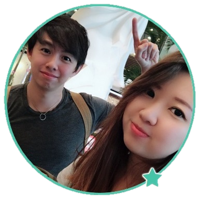 Take Surveys For Cash Review - Scam by Jason White! Jason White claims to be the “king of paid surveys” who made $274,000 just from paid surveys alone. Well, I’m here to stop you from buying his Take Surveys For Cash membership, and I’ll give you good reasons for it. Take Surveys For Cash is just one of many online scams out there, and it has fabricated a lot of fake evidence to lure you into the scam. Let’s find out. Much like any other online scams out there, Take Surveys For Cash uses an effective headline to catch the attention of unsuspecting internet users. Is making $3,500 per month just from taking surveys enough to entice you? Good. I was led to their website through an unsolicited email promoting the scam. You know, those occasional emails that link you to shady websites selling you stuff. This was one of them. From this short email alone, there are 2 links that bring me to the same sales page, and this alone should tell you something. What’s the motive behind this sender? Let me give you a bit of background information of how the entire scam works. Jason White, who is the creator of the fraud recruits affiliates to promote his scam. These affiliates are given commissions for every sale they make. Admittedly, there are a lot of great programs out there that recruit affiliates to help selling their products. Even Amazon has their own affiliate program. But Take Surveys For Cash is a different story. It’s built upon hypes that surround a dubious product, that you don’t even know what you are getting into until you have made the payment. To help his affiliates promote the scam, Jason White prepared a few email templates aimed at grabbing the attention of the recipients. These emails are then sent by affiliates to the victims. After going through their affiliate page, I realized that the email sent to me was copied entirely from one of the sales template prepared by Jason White. Remember how Jason said that he only has room for a few people to take up the opportunity? On the other hand, he is recruiting a massive number of people to send fake emails and even pay them for doing it. Obviously, there are no limited slots to his membership program. He just want to lure as many victims as possible into paying him. This money is then shared among his affiliates who promote the scam for him. Online fraudsters often go to great length in fabricating fake evidence and fake members, in order to show that their program works. In the screenshot above, Jason claims that he helped his friends and families make over $1,000,000 using the same method. He even had the pictures to show for it. However, these pictures are actually stolen from all over the internet. These pictures are totally unrelated to Take Surveys For Cash scam, and they have no reason to be featured here. The picture of the lady holding an iPad was stolen from a website called paintinganddecoratingnews, where it’s used to promote their locator app. The picture was stolen from the original website, and the logo of Take Surveys For Cash is then photoshopped into the picture to promote the scam. Not only that, the bank accounts shown in the sales material are photoshopped, too. Let’s look at the evidence below. Are You Guaranteed to Make Money with This Program? Will you really get the $50 bonus for free? 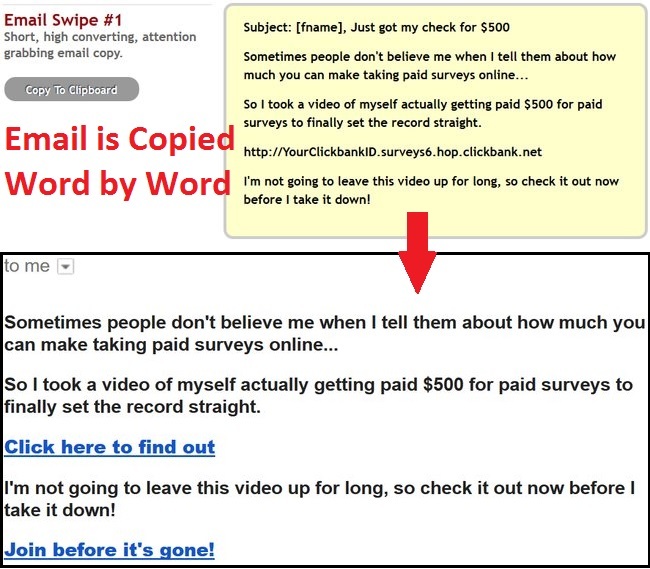 In the sales material, James White claims that you are guaranteed to receive a free $50 bonus when you take your first paid survey. However, I’ve had readers who bought the membership and never got their $50 bonus. Instead, they were instructed to sign up for even more paid membership programs, without receiving any real survey. 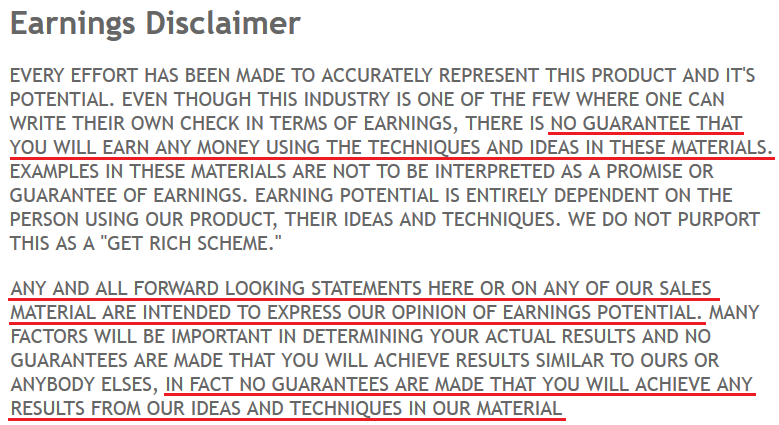 Most of them made the mistake of not reading through the earnings disclaimer before signing up. It’s extremely important to read the terms and conditions, because it’s a legal document. As much as the scammers want to keep you in the dark, they have to reveal the true nature of the scam somewhere in their website to avoid lawsuits. You can find the disclaimer through a fine print at the bottom of their webpage. In the disclaimer itself, it’s stated repeatedly that there’s no guarantee when it comes to making money with the membership you are buying. Apparently, this is totally different from what you are promised in the sales material. You were promised to make loads of money with the surveys you’ll be getting. To put it simply, the cheques and bank accounts shown in the sales material are not to be taken literally. It’s only meant to depict the “earnings potential” of the membership program. In other words, no real money has been made by anyone using the membership he is selling. To make the program irresistible, Jason decided to sell it at $39, less than the $50 bonus (essentially making it a no-brainer purchase). If the membership program is really as good as Jason claim, why is he subjecting himself to discount after discount? Is he really hell-bent on helping a stranger get filthy rich? Of course not. The program costs close to nothing to produce, because it’s just a bunch of affiliate links that lead you to other scam programs. He can even make a cut of commissions if you pay for additional scams through his membership program. Yes, it is a scam. I strongly discourage you from buying Take Surveys For Cash because it doesn’t offer anything helpful. Most victims fall prey to scams and poorly made programs simply because they don’t know there are better alternatives out there. It is nothing but a big scam. They offer a guarantee if in two months no paid surveys have been received, but when one claims they do not even respond. They are thiefs.